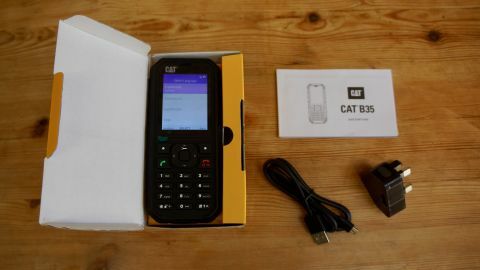 It’s only an old school feature phone, but the Cat B35 makes the most of its KaiOS operating system to deliver key apps like Google Maps and Assistant, while the back-to basics-design is more rugged and cost-effective than a smartphone and it’ll last many times longer on a single charge. At first glance, this chunky feature phone appears to be way out of its depth among the many rugged smartphones we have been testing recently, but the Cat B35 is smarter than it looks. Like the rebooted Nokia 8110 banana phone, it runs KaiOS, which makes it able to offer simplified versions of apps like Google Maps and YouTube. So although there’s no touchscreen, you can still surf the web over 4G using the button keypad or indeed, talk to Google Assistant. It’s all quite rudimentary, of course, but there are obvious advantages to a workforce that may have to use a mobile phone in adverse conditions. You can operate the keypad with wet, or gloved hands, for instance and the battery lasts for weeks, not days in standby. And of course, it is considerably cheaper, although there it looks as though there is still some premium to pay for the Caterpillar branding. The cost is $126 (around £96 or AU$176). Before the iPhone landed in 2007, most mobile phones looked something like this. The narrow candy bar form factor fits in the pocket more readily than a smartphone and without all the Gorilla glass, it is considerably lighter too. The plastic shell is ribbed for extra grip and strength and the plastic casing projects slightly further than the front display, so you’re unlikely to damage the titchy 2.4-inch screen if you drop it face down. The 21 backlit buttons of the keypad click comfortably and register with a beep when pressed if you want them to. You have to look closely to find the three rubber seals that conceal a headphone jack, a micro USB port for charging and data transfer and a SIM tray that will accept two nano SIM cards and a microSD memory card. There’s a fairly large speaker grill at the rear and a basic 2MP camera lens and at the top of the phone is a weak, but very well placed torch which has its own button on the keypad. This small and light handset feels far more robust than any of the ruggedized smartphones we have seen. he funny thing about feature phones is they have very few features, compared to a smartphone. However, the KaiOS operating system, designed by Google, does bring some smartphone style functionality. Google-owned apps such as Maps, YouTube and Google Assistant are built in for example. With no touchscreen, you’re somewhat limited as to what you can do, but this phone makes the most of its limitations. The 2.4-inch display manages a meagre 240 x 320 pixels, so it’s hopeless for showing photos, but bright and sharp enough for map reading. The only camera is a tiny 2MP job, so your photos won’t be very detailed anyway. Wi-Fi, Bluetooth and 4G LTE are all integrated and the phone is built around a 1.3GHz dual core Qualcomm processor, which is enough to power KaiOS without a hitch. The battery is big for this type of phone, but a quarter the size of a rugged smartphone. Nonetheless, without a touchscreen to drain the lithium ion, this feature phone will outlast any smartphone by a fortnight. The talk time here is given as twelve hours and standby as 30 days. What you don’t get is fingerprint of face recognition, video conferencing, mobile payment, a barcode scanner, Uber, internet banking, Spotify…in fact, this list is going to be much longer than the feature set, so we’ll stop there. Suffice to say that you cannot take a selfie either. For taking and making calls, the Cat B35 is a genuine pleasure to use. Even the initial start-up sound effect, the rumble of a big diesel engine, is fun. The lightweight handset is tactile in its satin plastic finish and the backlit buttons of the keypad are easy to operate with wet hands, or while wearing gloves. The interface takes you right back to the innocent pre-iPhone era when there were no time-sapping social media apps to update and your battery lasted for a week. Thankfully, some of the more essential apps have made it onto the KaiOS system, including Google Maps. It looks primitive on such a small and low-res screen, but it will get you home if you’re lost. Messaging is fine, once your contacts are imported, although typing is laborious without an onscreen keyboard and surfing the web is even more tedious as it involves nudging a cursor down the screen rather that scrolling. Thankfully, Google Assistant is there to listen to your spoken web searches, which is just what you need when you’re outside and your hands are too busy to use a touchscreen interface. The few simplified apps that are installed open quickly and don’t crash. Call quality is good and the speaker is quite loud, which could be important if you work on a noisy building site. The camera is poor quality and video looks terrible on the tiny screen, so the YouTube app is rather disappointing. The functions that a worker is more likely to need, work well. For example the torch comes on with just one long press of a button, whereas with a smartphone, you would need to wake the phone, enter a passcode (without gloves on) before you can scroll to the torch button. The Cat B35 doesn’t do much, but what it does, it does well. It is smarter than your average feature phone and apps like Google Assistant, which lets you search the internet for solutions to workplace problems by voice, is implemented well. With two SIM slots, 4G and Wi-Fi, you are no less connected than with a smartphone, but without a touchscreen, there are a great many apps that are simply not available. You can’t download a virtual spirit level when you need one, for example, but the advantages of using a feature phone in an outdoor workplace are many. It’s more rugged, the battery lasts much longer, basic communication and features like the torch can be used without taking your gloves off. It all adds up to a tool that seems just right for a certain king of job. The only thing stopping us giving this well built and well aimed handset five stars is the price. Yes, it is the most affordable rugged handset we have tested, but feature phones rarely cost more than $63.91 (£50) and you can buy a decent rugged smartphone like the Blackview BV5800 Pro for only $191.74 (£150). Clearly the Caterpillar branding commands a certain premium and on balance, we think it is worth it.